Dave Shields, author of bike racing novel The Race in 2004, is the hardest-working man in publishing. With the release in April of The Tour, he's been all over the web and out on the road to promote it. He followed the Tour de Georgia, selling books out of a tent in the Expo. We saw him there at the Expo at the Tour de Georgia near the top of Brasstown Bald in April, on our way to the top. When we came back down, there was an accident partway down the mountain, which backed up the bus line. Shields came over and was working the bus line, selling those books. Shields has managed to make his two books on racing topical, almost prophetic; The Race is about a rider from Utah who dreams of the yellow jersey, while The Tour includes a doping scandal that impacts the Tour (okay, you don't have to be Kreskin to come up with that one). With the Tour underway, Shields did a guest spot with Locutus and Saul Raisin on Daily Peloton's live Stage 2 coverage and is posting regular updates at Elegant Variation, linked above. NPR's Alex Chadwick did nearly 8 minutes on-air with Daniel Coyle, author of the new biography, Lance Armstrong's War. The link above takes you to a page where you can listen to the interview in RealPlayer or Windows Media Player. Some good bits: A friend told Coyle he saw Dr. Michele Ferrari in Girona in March, long after Armstrong reportedly ended his relationship with the controversial Italian sports doctor. Styled “Dr. Evil” in Coyle's book, Ferrari had the apartment upstairs from Coyle in Girona while he researched the book. He also talks about Armstrong's “Achilles Hip”: Coyle's book recounts how Armstrong's right hip and lower back locked up before last year's Tour, and his chiropractor snapped his hip back into place (with an audible crack!). Armstrong got up, headed out, and never again mentioned it. That was a scene that shot through my mind when I heard about Armstrong's training crash last week. VeloNews: So, after nearly a year trying to figure it out, maybe we should start with the central question in your book: What is it that drives Lance Armstrong? Dan Coyle: It's the fight. He loves to fight and he loves to win. And he doesn't want to win by a small margin, he wants to dominate. It's a drive that motivates him in every aspect of his life. The first web review I saw was over at Operation Gadget: "Start Reading 'Lance Armstrong's War'"
Also from the blog world: this from Infectious Greed. I've finished a quick runthrough, and liked it a lot. I would have read it no matter what, of course, but the author, Daniel Coyle, is responsible for a lot of the articles that have kept me a subscriber to Outside Magazine over the last few years. His book winds up being about the whole solar system surrounding Planet Lance; I feel like I learned more about the psychology that drives Tyler Hamilton, Floyd Landis, and Michele Ferrari than about Armstrong's mindset, but Armstrong has never exactly been an open book. I'll try to have a full review of my own later this week. Ben Barnes is an American pulling domestique duty on a Euro team in support of a legendary French champion. All of the action takes place over the course of two Tour de France stages, one an epic culminating in the climb up Alpe d'Huez, in this novel of the Tour. Shields focuses on the mental game of cycling, and fills in details about Barnes' development as a rider, his rivals, and his life off the bike through the kind of mid-ride contemplation we all go through when the rhythm of the pedals takes over. The Race also does a good job filling in the day-to-day details that make up life on the Tour, and introducing the tactics and strategy of the sport. The pacing is so good I read it in one sitting. My only complaint with the book is that it feels somewhat idealized; Barnes is a little too heroic, and the sport is presented at its most gladiatorial. For my money, I like the downer of Ralph Hurne's The Yellow Jersey a little better, but The Race is more focused on the sport than Hurne's book, which is more of a character study of a journeyman cyclist who, because of a doping scandal, winds up holding and fighting for the maillot jaune. Like Tim Krabbe's The Rider (which I haven't read), much of the story unfolds during a single stage, illuminating the main character through his riding. Amazon ratings for The Race are phenomenal -- all but two of 23 reviews are 5 stars, with the other 2 reviews awarding 4 stars. This was one of my birthday presents this year, and a great gift for any Tour fan. The book traces the Tour from its beginnings in 1903 through the 2003 edition. Commentary is from two French sporting newspapers: L'Auto, the Tour's original sponsor, and L'Equipe, its successor. Many of the early stories are bylined, and written by Tour founder Henri Desgrange, but most of the more recent staries are uncredited. It might ahve been nice to compare the biases of the writers, since the profiles go well beyond a dry summary of each year's events. The stage winner yesterday and sixth in the GC, Tyler Hamilton is a strange kid. A small boy from another world who concentrates the quintessence of his strength in one small corner of his mind. Tyler is a Jedi knight, a warrior straight out of Star Wars. He bearrs a disarming tranquility within him. He never swears, whether against those who don't believe in him or against the heavens which inflict such trials on him. He always says 'Thank you.' He thinks ceaselessly of others, and feels indebted to them each morning. A funny man, out of time, out of fashion. When he moves, his gestures are slow, very slow. His eyelids are always half closed and his barely delineated lips scarcely move. He speaks like a ventriloquist, although his smile, rare, always opens with real purpose. He is just and good, beccause the Tour de France admits no lies -- it reveals you as you are. Since his fall on the first Sunday of the month, analysed from every angle in the world's media, and destiny dictated that he ride the centenary Tour with a fractured collarbone, Tyler Hamilton has been divulging his truth despite himself, although he is as secretive as a tomb. It's fun to track the development of riders through their career, and the book is careful to tip future winners in photos or by pointing out where they first made a stir in the Tour. Well covered, for instance, are Lance Armstrong's sad and triumphant roles in the 1993 Tour, where teammate Fabio Casartelli died on the course, and Armstrong won a stage in tribute. There's also a foreshadowing shot of Armstrong climbing into the broom wagon in 1996, a few months before his cancer was diagnosed. All the Five-Timers are covered in depth. The scandals of the Tour aren't whitewashed: There's coverage of Tom Simpson's death on Ventoux and the Festina affair of 1998. The strange corners of Tour history are here, too: I think my favorite is Joop Zoetemelk finally winning the Tour at 33 in 1980 after finishing 2nd five times (he would again in 1982). 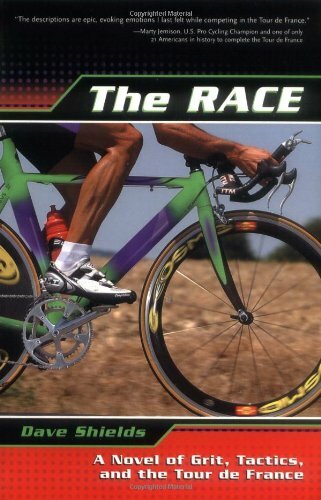 This is a perfect coffee-table book for bicycle racing fans.